If you do not know who Douglas Rushkoff is, it is not too late to catch up. You will not regret it. He is the Naomi Klein male version. While I am not sure, he would appreciate I say this, this is, if I am right, his twentieth books on culture, the digital economy and media, and he only gets better, clearer, wiser, punchier and to the point, with each new book. Rushkoff knows how to inspire and shock the crowds by revealing flaws and exposing false assumptions. His unique vision of the Techno-hyper-mediatized landscape is a perception we cannot do without. In this new book, “Team Human,” Rushkoff zeroes in on the pervasive effect of our most cherished human accomplishment: our technology, and what it is doing to you, to us, to our society . . . Here I will defer my authority to his clarity of thoughts and future projections. Get his book now. 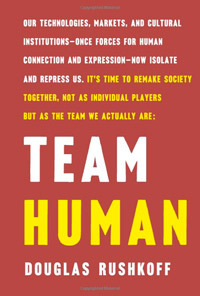 “Team Human” is a manifesto―a fiery distillation of preeminent digital theorist Douglas Rushkoff’s most urgent thoughts on civilization and human nature. In one hundred lean and incisive statements, he argues that we are essentially social creatures, and that we achieve our greatest aspirations when we work together―not as individuals. Yet today society is threatened by a vast antihuman infrastructure that undermines our ability to connect. Money, once a means of exchange, is now a means of exploitation; education, conceived as way to elevate the working class, has become another assembly line; and the internet has only further divided us into increasingly atomized and radicalized groups.